One of Sophocles' more accomplished dramas, the Electra has always generated a good deal of scholarly debate. 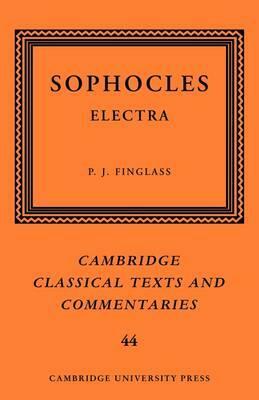 This 2007 edition, the first full-scale commentary on any play of Sophocles since the nineteenth century, explores afresh long-standing controversies such as the moral status of the killing of Clytemnestra, while also investigating many subjects which have traditionally attracted less attention, such as the place of rhetoric within the drama, the use of typical scenes, and allusions to epinician poetry. It provides original metrical analyses of the lyrical sections of the play and a revised Greek text. Research on the papyri, mediaeval manuscripts and printed editions has led to a more accurate apparatus criticus than ever before, with many conjectures attributed to their rightful owners. Introduction; SOPHOKLEOUS ELEKTRA; Commentary; Appendices. 'Number 44 in the 'Classical Texts and Commentaries' series does not disappoint. ... Accessible and humane, it is a must for the university library and will be a great asset for anyone teaching the play.' Journal of Classics Teaching 'All in all, Finglass has met the multiple challenges posed by so intractable a text magnificently.' Journal of Classical Philology 'This is a superlative commentary whose learning and acuity would do credit to a much older scholar ... [It is] an astonishing feat to write such a full and thoughtful commentary in such a short time.' David Kovacs, Bryn Mawr Classical Review '... shows profound perceptiveness and wide learning at every corner ... No review can do justice to the immense scope and the breadth of vision of the commentary ... With this authoritative edition of Sophocles' Electra Finglass exegit monumentum aere perennius [has completed a monument more lasting than bronze, Horace Odes 3.30.1] in the annals of classical scholarship.' Andreas Markantonatos, Exemplaria Classica 'An impressive debut ... Finglass is a stimulating commentator to study, and disagreement with his position never leads to disrespect for it. This edition will provide the starting point for discussion of the play for many years to come.' Hayden Pelliccia, Classical Review 'An ambitious new text, apparatus, and commentary that makes full use of ... developments in classical scholarship ... this edition of Sophocles' Electra is a work of critical acumen and great learning. Its many readers will be grateful that this remarkable play has been served so well.' Francis Dunn, New England Classical Journal 'It is a relief to read his balanced interpretations after so many attempt to read into the play what is not there ... I welcome his interpretation of the play as a whole.' Anna Maria van Erp Taalman Kip, Mnemosyne 'For any question even remotely connected to this play - palaeographical, papyrological, mythological, metrical, topographical, stylistic, orthographic, and so on - this is where I'll start ... This will be the text and commentary to use and consult for years to come.' David Schenker, Classical Bulletin "This is a superlative commentary whose learning and acuity would do credit to a much older scholar." Bryn Mawr Classical Review "An impressive debut ... Finglass is a stimulating commentator to study, and disagreement with his position never leads to disrespect for it. This edition will provide the starting point for discussion of the play for many years to come." Classical Review "An ambitious new text, apparatus, and commentary that makes full use of ... developments in classical scholarship ... this edition of Sophocles' Electra is a work of critical acumen and great learning. Its many readers will be grateful that this remarkable play has been served so well." New England Classical Journal "For any question even remotely connected to this play - palaeographical, papyrological, mythological, metrical, topographical, stylistic, orthographic, and so on - this is where I'll start ... This will be the text and commentary to use and consult for years to come." Classical Bulletin "Number 44 in the Classical Texts and Commentaries series does not disappoint ... Accessible and humane, it is a must for the university library and will be a great asset for anyone teaching the play." Journal of Classics Teaching "Finglass ... shows profound perceptiveness and wide learning at every corner ... No review can do justice to the immense scope and the breadth of vision of the commentary ... With this authoritative edition of Sophocles' Electra Finglass exegit monumentum aere perennius [has completed a monument more lasting than bronze, Horace Odes 3.30.1] in the annals of classical scholarship." Andreas Markantonatos, Exemplaria Classica "All in all, Finglass has met the multiple challenges posed by so intractable a text magnificently." Journal of Classical Philology `It is a relief to read his balanced interpretations after so many attempt to read into the play what is not there ... I welcome his interpretation of the play as a whole."